It’s definitely time for drastic action when things jump out at you when you open the fridge. After getting bopped on the forehead by a militant lemon and stubbed in the toe by a rambunctious bottle of pesto, I knew it was time to make in-roads on the leftovers I carted home on the weekend. I decided to liberate some duck livers. My girlfriend had ambitiously purchased these in the hopes of some homemade pate and apparently it was an unmitigated disaster. 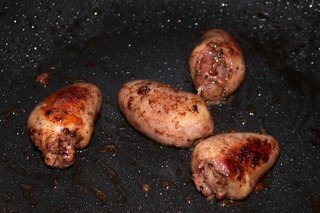 These were the leftover duck livers which she off-loaded on me with much relief. After her misfortune, I was rather reluctant to make pate too although I’ve never messed those up yet. The night of the Galbi Tank fiasco, I had spent some time thinking of a kumquat-based sauce for duck. 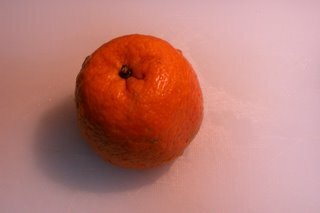 Kumquats are especially abundant now that it is Chinese New Year and I have always preferred them to normal oranges anyway. 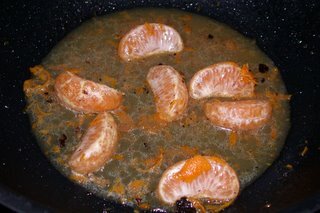 Although I had no duck at hand, I suddenly wondered if my kumquat sauce concept might match the duck livers. Hmmm … it may well be a marriage made in heaven or a Henry VIII and Anne Boleyn-type divorce. It was getting late so I just went for it. Another meal out of leftovers. At this rate, I will be known as Queen Leftifah. Do or die … I keyed in a doctor friend’s number on quick dial just in case. Poor Malcom probably regrets appointing himself as my doctor of mercy. Please note that the measurements are guesstimations as I typically do not measure when I cook. So the best way is to taste and adjust as you cook. 1. Right, here’s the icky part – cleaning the livers. Wash the livers gently in cold water a couple of times. Trim off all the yucky white fats etc from the liver and remove the hearts, making sure to trim them well too. 2. Soak the livers and heart in milk to cover. This will help to remove the blood while improving the flavour and colour. I know, the sight of the pink milk was rather off-putting. 3. Heat the duck fat in a pan and add the livers. 4. Sprinkle salt and pepper on each and let them alone! Do not move them around, turn them or even breathe on them for at least 1 minute! Mine were fairly huge so I sautéd them for close to 2 minutes before turning them. 5. Sprinkle salt and pepper on the other side. 6. After 2 minutes, remove from pan and set aside but keep it warm by covering with a towel. 7. Add the hearts to the pan and sauté for about 3-4 minutes, stirring occasionally. 8. Remove from pan and set aside with the liver. 9. Deglaze the pan with the orange juice and potato water. 11. Let it reduce to almost half the amount before adding the brown sugar, kumquat zest (sans 1 tsp reserve as garnish) and the Cointreau. 12. Add the kumquat segments and continue cooking for about 1-2 minutes till the skin becomes transparent. 13. Add the orange-ginger marmalade and cinnamon and cook for 1 minute till thickened. 14. Plate the dish with the garlic, sage and potato mash (steady .. recipe incoming below), the duck livers and hearts above this and the kumquat sauce drizzled above and around it. 15. Finish with a sprinkling of the kumquat zest on top. Trust me, it tastes loads better this way. 1. Boil your potatoes in a pot of water with the garlic cloves. 2. When the potatoes and the garlic are soft when you pierce them with a fork, drain the water (reserving a few tbsp for your kumquat sauce). 3. Season your potatoes, add your butter and begin mashing. G’wan, use some elbow grease! 4. Add enough milk to make your mash fluffy and creamy. You can add more butter or milk according to taste. 5. Tear the sage leaves and sprinkle onto the mash and mix well. This sounds terribly immodest of me but this meal was superb. The duck livers might have been a tad over-cooked but I was veering on the side of caution because I was not sure how long my girlfriend had had them. My kumquat sauce was a sweet success though. Ambrosial with a hint of Asian spices, it is a true fusion of East and West. The citrine perfume of the kumquat sauce had me salivating. Aromatic yet sweet, it was the perfect consort to the duck livers. The rich, velvety livers were wonderfully accentuated by the kumquats and balanced by the honeyed tones from the brown sugar and marmalade. The individual kumquat segments were nectared gems that burst into your mouth like little nuggets of liquid sunshine. 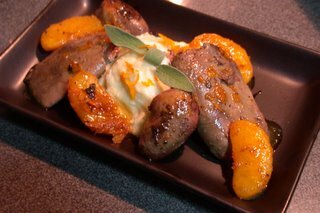 Perched redolently on a fluffy mound of garlic, sage and potato mound, the livers were gloriously mahogany brown and glistening with kumquat sauce. The mash had enough dimension not to be cowed by the strong flavours of its platemates but understated enough to stand its own. I will stick my neck out to say that this dish deserves a 9.5/10 for taste. It did not score a perfect 10 because I would have preferred my liver slightly less done and I thought I could have added more sage leaves to the mash. But still, for something I just came up with on the fly, it’s a stupendous dish. Healthwise, it is a bit rich but the kumquat sauce balances that out somewhat so I will give this dish a 7.75/10. It’s thrilling to come up with another East meets West (hackneyed as that is) fusion and I will definitely make this again. The only downside is that I could not finish all the liver so I saved these … more leftovers! Will this never end??!!! I love duck or chicken livers and your recipe sounds great! Thanks so much Bea. I did rather like it myself! And I love your blog and recipes! Your meal does look and sound superb!